People are being warned to take extra care on level crossings because work to upgrade the Great Northern Great Eastern line is making trains faster and quieter. Network Rail says it is transforming the Victorian infrastructure of the (GNGE) line into a modern railway. Track has been replaced from Peterborough to Doncaster, with much of the line running through Lincolnshire. Trains will increase to speeds of up to 65mph from 31 August. Mark Walker, a consultant for Network Rail, said: "We want people along that route in those communities to be aware that this means trains will be able to travel faster, and they will be quieter. "It is noticeable how much quieter the trains are, and that means if you have tended to view this as a very quiet and little-used railway we want to make people aware that may not be the case in the future." The work is part of a £280m government-funded modernisation of the GNGE line. Network Rail is creating additional capacity on the line, so passenger and freight train operators can run additional trains. Mr Walker said: "Our railways have been growing over the last several years at quite an extraordinary rate in terms of numbers of passengers and the amount of freight carried, and we are really opening up the potential for Lincolnshire to share in those benefits." 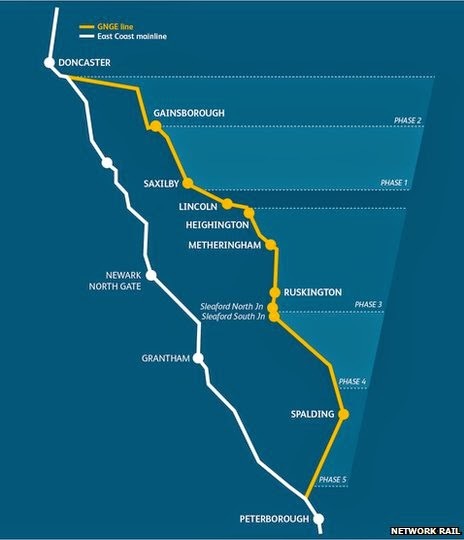 The line is being closed between Doncaster and Gainsborough for two weeks, from 16 August to 1 September, so engineers can replace and repair bridges and lower tracks. This will allow taller containers to travel along the line. Passengers are being warned to check National Rail Enquiries for details of replacement buses and alternative trains.